In Ahmedabad, located in the heart of Gujarat state, Dalits have been an important but often invisible presence for generations, working as scavengers and waste-clearers within the strict confines of India’s caste system. Concentrated on the periphery of the city, frequently segregated from other communities, many had also migrated to the city in search of work in emerging industries such as Ahmedabad’s textile mills. Nevertheless, though strong caste and communal barriers remained in place, Dalit settlements existed alongside upper-caste and Muslim neighbourhoods in the city centre and the nearby industrial townships. However, over the last few decades a number of violent incidents, including anti-Dalit riots in 1981 and communal violence in 2002, have reinforced divisions. This case study, drawing on interviews conducted in December 2014 with a number of activists and community members based in the city, highlights some of the key challenges facing Dalit women today. According to Madhuben Koradiya, a Dalit women’s rights activist with the Ahmedebad based NGO Navsarjan Trust who was interviewed for this case study, the closure of many of the city’s mills in the 1980s and early 1990s also precipitated a crisis for Dalit women. In previous years Dalit women had been making some small gains, with some even managing to secure low-level government employment, but this tentative progress halted with the collapse of the textile industry: ‘[It] led to large-scale joblessness among men, following which Dalit women were forced to do any job they could lay their hands on, even as construction workers, in order to help the family. A huge oversupply of labour in the job market meant less wages…. Women have nowhere to go, except to work as daily wagers or home-based workers.’ As a result, their livelihood options deteriorated: ‘Things have further worsened over the last 10 to 15 years. Dalit women are doing such jobs which I could not even imagine when I was young. They are ready to work as guinea pigs for pharmaceutical companies, which use them to experiment with the reaction to medicines of the human body. They are ready to become surrogate mothers for money.’ Following the outbreak of communal violence across Gujarat in 2002, the situation for Dalit women worsened. Though Muslims were exposed to the worst of the violence, the ‘next biggest casualty’ were Dalits: ‘Out of more than 1,000 killed, more than 100 were Dalits. The young Dalits were misguided by the saffron brigade [right-wing Hindu extremists]. Now no one takes care of the families of many of the Dalits who were arrested for the riots or those who died. The condition of women is particularly in bad shape. Many women have been pushed into such illegal activities like brewing country liquor and prostitution, and there is little anyone is doing.’ The challenges Dalit women face, though overlapping with general issues of urban poverty and gender discrimination, are in many ways distinct from the issues that face the female population as a whole. Ahmedabad has a number of active women’s organizations, but while these often have a large Dalit constituency among their members, their focus generally is not on specific incidents of discrimination. While a trade union may periodically train its members on issues of sexual violence and harassment, for example, it usually avoids taking up human rights issues related to atrocities against Dalit women. Solidarity was also undermined following the 2002 communal violence. Preeti Vaghela, another activist based with the Navsarjan Trust, described how prior to the riots Dalit and Muslim families lived side by side in some parts of the city. However, in the aftermath, the interaction between women from different communities came to an abrupt halt: ‘[Until 2002] women interacted with each other. However, following the riots, Dalits have fled many of these areas, and got scattered to different places. The social fabric which women had built around themselves, even among Dalits, has broken apart.’ Ramilaben Babubhai Parmar, a researcher who was involved with Navsarjan Trust in a survey of the city’s sanitary workers, reports that among Valmiki – probably the most marginalized of all the Dalit sub-castes – most women work as sanitary workers, whether it is for the municipality or housing societies. 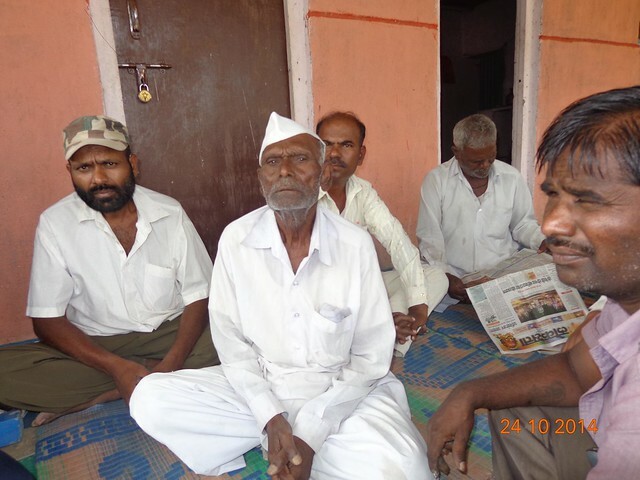 In one slum area in western Ahmedabad, situated within an affluent locality, around 70 Valmiki families live in huts with no access to water, sanitation, electricity or any form of government support. None yet have the luxury of a concrete house, in part because their homes have been destroyed by local authorities as illegal several times already. All face the constant threat of eviction. The settlement is surrounded by expensive flats, whose owners employ some of the women as sweepers. Research interviews with a number of Valmiki women living in this area highlighted the continued discrimination they faced in their employment. Another Valmiki woman, when asked why she did not refuse to work as a manual scavenger as it was prohibited by law, smiled and said, ‘Do you want us to lose our job? If we do not do the work, we will be replaced by others.’ This seemed to be the case even when they had been lucky enough to access some secondary education. Based on the accounts of the women interviewed, it appeared that even those Valmiki women who had managed some study were still condemned to the same manual labour their ancestors had been forced to perform. Though these issues are not usually as pronounced among non-Valmiki Dalit women, discrimination in Ahmedabad is still widespread even among the less stigmatized Dalit groups, as Koradiya describes: ‘It is rarely visible, but one can feel it does prevail in the dominant caste behaviour. In an interaction, Dalit teachers complained to us that while they would sit together to take an afternoon meal, nonDalit women as a rule would not like to share food with them, nor would the non-Dalit women ever offer them water. The feeling of distance was always visible.’ Sexual harassment, too, remains a serious challenge for women in Indian cities in general, but is especially acute for Dalit women, who are vulnerable due to their secondary status. For example, Leena Patel, a Dalit journalist and social worker interviewed for this research, highlighted the experiences of Dalit women working in the city’s diamond polishing industry.